We offer a comprehensive list of general dentistry treatments for you and your family to maintain your teeth in optimum condition. This involves a thorough check of all the teeth for cavities (decay / caries), broken or discoloured fillings, fractures, etc. 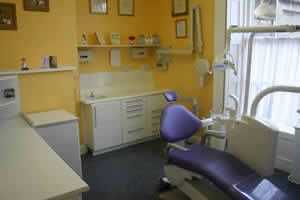 We also check the gums for any signs of gum disease or any other problems. We check all the areas in the mouth for any sign of oral cancer. If you could benefit from orthodontics (braces) or any sort of cosmetic treatment we will tell you. We will check your child’s teeth and mouth for any problems, with particular emphasis on prevention of possible future problems. 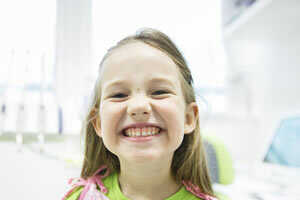 If you feel your child needs some motivation tell them that the dentist is going to count their teeth. If you are worried they will not open their mouth bring their toothbrush so they can show the dentist how well they brush. These are all the same disease that often leads to tooth loss. The process of gum disease starts with the build up of plaque. Plaque is the white film of bacteria that builds up on the teeth every day if this is removed from all the areas three times a day by good brushing and flossing the gums remain healthy and will cause you no trouble. However, any plaque left in place irritates the gum causing a mild condition called gingivitis. Plaque continues to absorb calcium from your saliva and hardens into tartar (calculus), this is just like the scale in your kettle. Most people get some tartar build up especially behind their lower front teeth regular cleaning every six months prevents this causing any significant damage. The treatment for very severe gum disease is a very thorough cleaning off of all the tartar from all the areas over several visits usually with local anaesthetic. However, if this is not removed the tartar slowly and painlessly eats away at the gum around the teeth causing gum recession (peeling back) and/or pocketing around the teeth. The process will continue slowly until the gums are so eaten away that the teeth get loose or even fall out. You can often get gum infections (abscesses) once they are very bad. 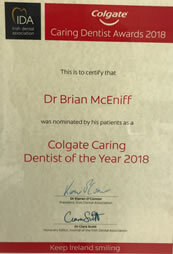 Sometimes specialist treatment from a periodontist is required. There are several factors that make gum disease worse: smoking; badly fitting dentures, crowns or fillings; diabetes and pregnancy. Brush three times and floss once a day. Use a soft or medium textured toothbrush with a compact head e.g Oral B 30/35. 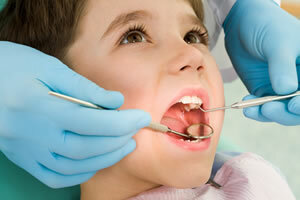 Have your teeth checked and cleaned every six months by your dentist or dental hygienist. 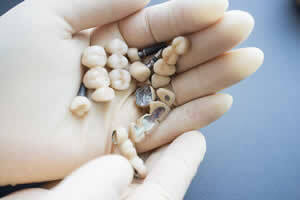 We provide all the latest type of fillings, either white or silver on back teeth and always white on the front teeth. A filling replaces part of a tooth that has been lost because of decay (causing a cavity) or accidental damage. There are two basic types of filling: white or metal (silver amalgam). On front teeth we always use white fillings. On back teeth we normally use metal fillings because the biting forces are huge and normal white fillings are not strong enough. If the filling on the back tooth is not on the biting surface you can do a normal white filling. If you do not want any metal in your mouth you can place high strength white fillings on the biting surface. These will look much more natural but are considerably more expensive and are not quite as strong (about 90%) as the metal fillings. Decay (or Caries) is caused when sugars in food or drink we consume is converted into acid by bacteria in our mouth. If too much of this acid is produced too often it will eat away at the tooth enamel causing a cavity in the tooth. This can continue until the decay reaches the nerve inside the tooth. Decay is treated by removing it and replacing the missing tooth with a filling. The sooner that decay is detected and treated the better, it usually causes no pain until it gets close to the nerve. The closer it gets to the nerve the greater the chance that the tooth cannot be filled and may need a Root Canal Treatment or extraction. RCT is a procedure that involves cleaning out, disinfecting, and sealing off the inside (pulp chamber / nerve) of a tooth. It is a time consuming, ‘fiddly’, but not painful job. It is normally done because the nerve of the tooth is dead and/or infected often because decay gets into the inside of the tooth. It can also happen when a tooth dies because it has a very large or deep filling, or if a tooth suffers trauma. Infected teeth cause very painful dental abscesses if not treated. Sometimes RCT is required to build up a tooth with a crown. If there is not enough tooth to build up with routine treatment we can place a ‘post’ into the tooth and use it as an anchor to hold a porcelain crown to build up the tooth to its proper size and shape. We cannot place a post inside a tooth unless RCT has been done. The alternative to RCT is usually the extraction of the tooth. RCT is normally a two-visit procedure. The first stage involves cleaning out any decay and/or old filling, opening up the inside of the tooth and cleaning everything out. Local anaesthetic is normally given for both visits even though the tooth is normally dead and in theory does not need it. I always play safe and use plenty of anaesthetic. Once the tooth is cleaned out, a disinfectant dressing is placed inside and sealed in with a temporary filling. This disinfectant is left inside for two to four weeks to thoroughly disinfect the inside of the tooth. You need to be careful with the temporary filling during this time; often, small chips will come off it or it may sink into the tooth slightly, this is not a problem. The tooth may be slightly sore for one or two days due to inflammation around its root. The second stage starts with local anaesthetic followed by the removal of the temporary filling and the disinfectant. If there is no infection left, the inside is filed and shaped correctly so that I can then seal off the inside of the tooth to prevent infection getting in again. Again the tooth may be slightly sore for one or two days due to inflammation around its root. Sometimes, if you are unlucky, the infection has not gone and the tooth needs another dose of disinfectant. If the second stage is not completed within two months of the first stage the disinfectant loses its potency and the tooth becomes infected again and the whole RCT needs to be started again. Once the RCT is completed the tooth is filled with a long term temporary white filling. The tooth needs to be checked three months later with a view to a permanent restoration, either a post retained crown or a posterior composite (a high strength white filling). RCT’s are not 100% successful – there is a failure rate of 5 to 10%. This means that there is a chance that the tooth can become infected and/or painful in the future. If this happens it normally happens in the first three months after the RCT. 2) Extraction of the tooth. In the long term a tooth with a RCT (or any dead tooth) becomes brittle. They normally have very large fillings already and increased brittleness means chunks of the tooth can fracture off leaving very little tooth left behind. Often a tooth with a RCT needs a crown to build it up and prevent this sort of fracture. If a tooth fractures under the gum level it often means that the tooth needs extraction despite having a RCT already. Small metal files are used to clean out and shape the inside of the tooth. Sometimes small pieces of the files break off and get left inside the tooth. This is not normally a problem as they usually seal off the inside off well. It can complicate things if the tooth needs a new RCT in the future. 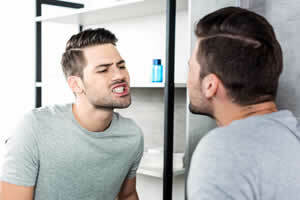 When there is not enough tooth left to fill due to damage from decay and/or trauma you are left with the choice of either extracting the tooth or crowning it. This involves shaving the tooth down and having a crown made in a dental laboratory which is them cemented onto the remains of the tooth to build it up to its proper size, shape and colour. Crowns are normally made from porcelain over a metal base. They last a long time, on average 15 to 20 years. A bridge replaces a missing tooth (or teeth) by fixing the replacement to the natural teeth at each side of the gap. Some bridges have crowns at each end. Others are fixed to the surface of the teeth next to the gap. Sometimes a bridge is only fixed to the tooth on one side of the gap. Bridges are made of metal and porcelain, or on occasions just porcelain. There are several stages in making a bridge. The dentist uses soft, mouldable material to take impressions of your mouth. A dental technician makes exact plaster models of your upper and lower teeth and gums, which show how your teeth bite together. The teeth which will support the bridge are prepared so that the bridge is not too bulky. Another impression is taken of the teeth and any gaps and the dental technician uses this to make the bridge. A plastic temporary bridge or temporary crown may be fitted in the meantime. At your final visit, the dentist will check that the bridge fits, make any minor adjustments and then fix it permanently in place. 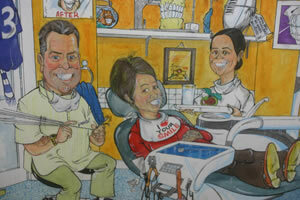 Your dentist or hygienist will show you the best way of keeping your new bridge clean. Sometimes a tooth is not savable and has to come out. This is never something to look forward to but if it is required we will make it as easy as possible for you by using plenty of local anaestethic and explaining everything to you as we go along. Do not Eat, Drink, Rinse or especially smoke for 3 hours after the extraction. Do not poke or prod the extraction site with anything i.e. your tongue, finger or a tissue. The area will have stopped bleeding before you leave the practice. If it starts bleeding again, don’t worry it’s not a big problem. Roll up a sheet of kitchen paper into a small ball. Place it over the extraction site and bite hard and constantly so the tissue is pushing into the extraction site area. Do this for an hour. (Do not keep checking it, leave it undisturbed) You may feel sharp edges in the socket with your tongue and small fragments of bone may work loose. This is normal. If you have been given antibiotics you must finish the course even if any pain or swelling have disappeared. Once the local anaesthetic wears off after about three hours the area will be slightly sore – this is normal. Make sure that you have a painkiller and take if necessary. Avoid strenuous exercise, hot drinks and alcohol for 24 hours after the extraction as these can cause the socket to restart bleeding. Do not rinse your mouth out excessively on the same day as the extraction as it will start bleeding again. It is very important to encourage healing and prevent infection to wash your mouth with warm salty water (glass of warm water + 1 teaspoon of salt) 4 times a day for 3 – 4 days. The area will be tender for a few days this is normal. It takes several weeks for the hole to fill in and the area will be sore if you bite on it for this time – this is normal. 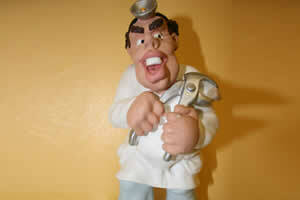 If severe pain starts a day or so afterwards it probably means that you have an infected socket called a Dry Socket. This is a very painful condition and affects at random a small proportion of extractions, smokers are affected more often than non smokers. If you get this infection contact the practice we can treat it and make it more comfortable.